Music therapy can often be used to facilitate communication skills with individuals. Children with communication disorders may benefit in many ways. Singing involves speech, language, auditory memory, pitch matching and fluency. The therapist may design singing experiences to address the specific needs of each child, such as articulation, inflection, breathing and pacing. For example, the therapist may leave blanks in a familiar song for the child to fill in the missing lyric. The music therapist may also create a song that focuses on practicing specific sounds/letters. For individuals who are nonverbal, music provides an avenue for expressing their feelings and thoughts. 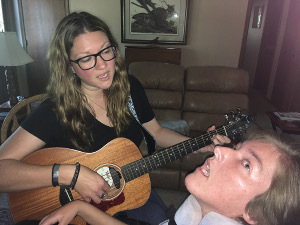 Through engaging in a musical relationship with the music therapist, an individual has the opportunity to communicate without necessarily having to speak. Sometimes people who do not speak, will sing. For example, for those who have dementia which impairs the speech areas of the brain, singing and playing music is still possible and provides an avenue for connecting with loved ones. For patients with traumatic brain injuries, music therapy can be a powerful tool for relearning the skills of language and communication. Representative Gabrielle Giffordsʼ rehabilitation received a great deal of attention in the press. In an interview where she could speak in sentences just a few words in length, she sang an entire verse of “Tomorrow” from the Broadway show Annie. Music therapists use the inherent properties of music within the therapeutic relationship to encourage and facilitate a variety of communication skills.